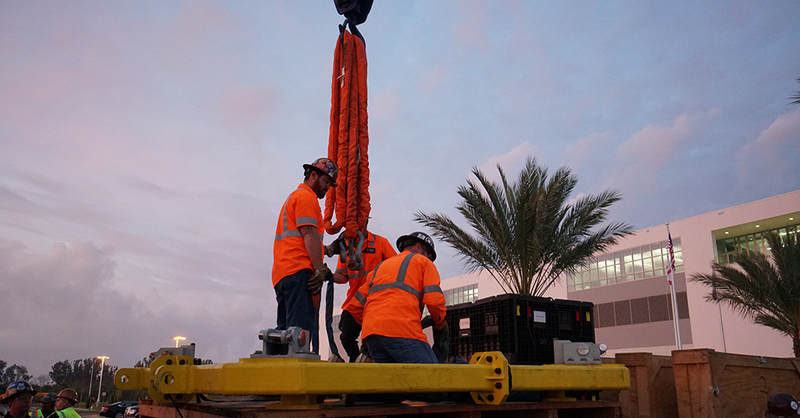 A well-maintained and functional crane is important for any heavy lifting application. Of equal importance is a quality sling for suspending the item to be lifted by the crane. Slings are available in various configurations and constructed with different materials including chain, wire rope and synthetic. Synthetic slings, which are most commonly made of nylon or polyester, are popular because of their lower cost and versatility. However, synthetic slings are more easily susceptible to damage and failure over time. Threats to the integrity of synthetic slings include temperatures over 180 degrees F, caustic substances, acids and ultraviolet rays. A feature in the December 2018 issue of American Cranes & Transport (ACT) addresses the risk of synthetic sling cutting and friction failure, and when to use an interface between the sling and load. The key is to assess the type of risk to the sling, then decide on the best sling protection against the load. It’s as simple as A, B, C.
A – Abrasion. Could the load surface cause friction, scrubbing or abrasion damage to the sling as it’s being stretched by the weight of the load? If so, protection must be used that will withstand the abrasion while relying on the strength of the sling. B – Bearing Pressure. The load’s diameter may be small enough to sever the sling’s protective barrier due to the pressure generated between the sling and contact point against the load. If the protective layer can be severed, it must not be used. As the sling contact width decreases, the pressure increases. C – Cutting. Does the load have a 90-degree edge? This can present a cutting threat to the sling, especially if the load is steel plate or has a machined surface. In this instance, the sling should be completely protected from direct contact with the load edge while being lifted or moved. Protection from severing and cuts is of utmost importance, even for wire rope and chain slings. Heavy lifting companies and their safety teams do well to educate themselves about slings and sling protection, and apply the A, B, C principals to their individual applications. Read the entire story at ACT’s website by clicking here.